The P Span Arena™ uses 'Parabolic Span' main structural arches to make the building predominantly clearspan and to support the cable reinforced fabric membrane roof which can be double skinned for insulation or incorporate a blackout to provide a typical 'black box' arena. The building uses innovative design and construction methods to achieve the value engineering targets originally set out. While most installations can be accommodated, the thermal and acoustic characteristics of fabric membrane roofs are occasionally unsuitable for the local conditions and require additional consideration. The building can house the same events as traditional constructions under those considerations. As may be expected, all local and national building standards will be adhered to. The flexible layout can accommodate typical arena 'U' shaped seating or other layouts. The building meets all current building codes world wide. P Span™ is a new concept which intends to provide 70% of the functionality at 30% of the cost of a traditional arena. In some instances 90% of the functionality. It is based upon our successful Valhalla portable membrane structure and is engineered for permanent installation. Design life with PTFE membrane is 30 years. The structure uses a unique 'patent applied for' construction method that reduces erection times and costs dramatically. Typically, arenas are multi purpose venues which are required to accommodate a wide variety of events. To allow the returns required to recover the investment, there are between 8,000 and 20,000 seats, with most seating around 12,000. In order to accommodate the optimum viewing sight lines, the seats have a severe rake which requires walls of up to 18 metres or 60 feet in height to clear. In addition, to avoid the 'tunnel' effect of long buildings, the typical arena structure is 60 to 80 metres in span to provide an equality of viewing distances. The roof of the building is required to suspend ventilation, heating and air conditioning, house lights, access passageways for maintenance, and occasionally, other suspended loads such as lighting rigs for rock concerts. 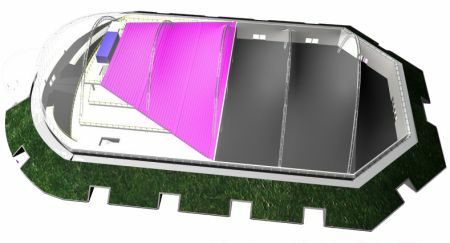 With the extreme span of the roof, the requirement to accommodate all environmental loads of wind and snow plus occasional suspended loads results in a very expensive construction, typically using conventional long span trussed steel members, or recently, cable supported fabric membranes. A typical arena features extremely high walls to accommodate the rake of the seating inside. Such walls are expensive to build and install. This combination of expensive long span roof and high walls means that the designer is limited in scope of design, and is unable to vary the fundamental form. A potential solution to this problem is to use a construction method which accommodates all the fundamental requirements yet is substantially more economical to construct. . The P Span™ is a mature concept which provides an optimum package for a low tech 'black box' which houses the same events as a conventional arena at a much reduced budget. We can also show how the use of 3 dimensional forms can allow the realisation of structures that were considered impossible to build only a few years ago. This use of complex forms can improve the performance of the structure while maximising structural performance and reducing complexity of installation. The building can house the same events as traditional arenas while achieving significant cost reductions. The building can be used in many different configurations. One of these features a fixed rear seating area with exhibition space below with a ceiling height of 9 metres or 30 feet. With the use of a front section of demountable seating, the structure could be completely used for concerts, using the front seating only for smaller events, or with the front seating removed, the whole of the ground floor is available for multi use.